NOW Ginkgo Biloba is grown and extracted under the highest quality standards and is standardized to min. 24% Ginkgoflavonglycosides and min. 6% Terpene Lactones, including Ginkgolide B, the most significant fraction, and Ginkgolies A, C and Bilobalide. Our Ginkgo Biloba Extract is the finest quality available worldwide. 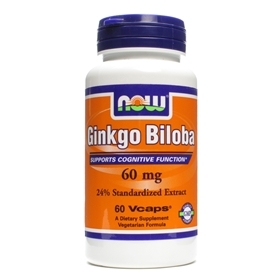 Scientific research has demonstrated that Ginkgo Biloba Extract has antioxidant activity in in vitro studies. Ginkgo extract has many proven benefits . This herb acts to enhance oxygen utilization and thus improves memory, concentration, and other mental faculties. The herbal extract has also been shown to significantly improve long-distance vision and possibly reverse damage to the retina of the eye. Studies have also confirmed its value in the treatment of depression, especially in elderly persons. In addition, ginkgo may provide relief for those who suffer with headache, sinusitis, and vertigo, and may also help relieve chronic ringing in the ears known as tinnitus. Ginkgo has been studied for its effectiveness in the treatment of so many conditions. They Include: Alzheimer's disease, Cerebral atherosclerosis, Cerebral insufficiencies, Cochlear deafness, Dementia, Depression, Menopause, Peripheral and Cerebral Circulatory Stimulation, Peripheral Vascular disease, Raynaud's Syndrome, Retinopathy, Senility, Long & Short-term memory loss, Tinnitus, Vascular Diseases, & Vertigo. It can increase blood flow to the extremities for people with blood sugar & neuropathy issues. Raynaud's disease is believed to be caused by bloodvessels that over react to the cold and spasm, reducing blood flow and there by depriving extremities of oxygen. Ginkgo biloba may help this condition by widening the small blood vessels, which would keep these spasms from completely blocking the blood flow. It also increases blood flow to the brain, thus helping parkinsons patients relieve symptoms by allowing more of the depleted dopamine to be circulated to the areas that need it most. Suggested Usage: As a dietary supplement, take 1 Vcap® 1 to 2 times daily. Consider taking this product in combination with NOW® Phosphatidyl Serine, Soy Lecithin and DMAE. Other Ingredient: Vegetable Polysaccharide (capsule) and Magnesium Stearate (vegetable source). Caution: Consult physician before consumption if you are currently taking anti-coagulant or MAO inhibitive drugs.